Habitat: Riparian. It grows in or near water from the desert to upland areas and is almost always found growing in wetlands (about 99% of the time). Flowering Season: Summer. Depending on the summer monsoon rains and available water, this plant blooms from June to September. 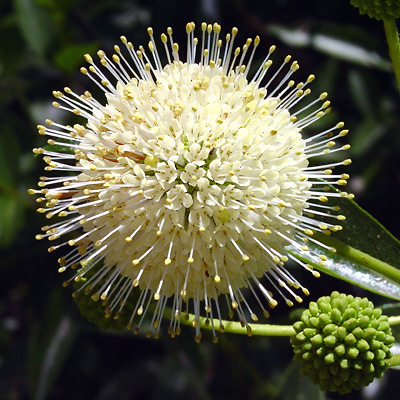 Description: The flowers are in 1 1/2 inch (3.8 cm) wide, ball-shaped, pincushion-like clusters. The individual flowers have 4 lobes and a long, yellow-tipped style. The flower clusters are followed by similarly shaped, brown, woody seed balls. 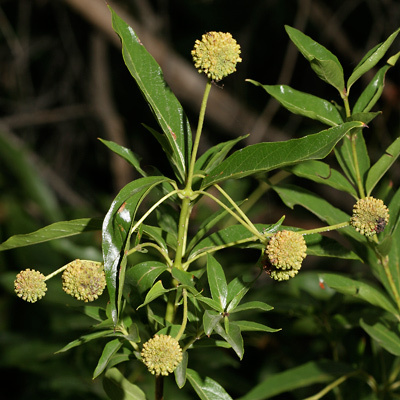 The leaves are shiny, dark green, and lance-shaped with finely-toothed margins. The stem bases are swollen. 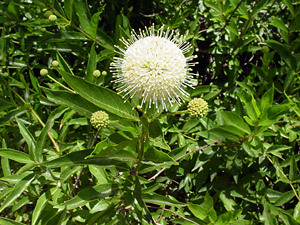 Although this plant is poisonous, butterflies and hummingbirds visit the flowers and waterfowl eat the seeds, making it a good wildlife food plant. Poisonous – This toxic plant contains the poison cephalathin, which can cause vomiting, convulsions, and paralysis if ingested.